These days, customers aren’t just picking up the phone, shooting you an email, or coming into your store for support. As review forums such as Yelp, TripAdvisor, and Google Local have grown in popularity, consumers have begun to use them to voice complaints and questions. Most small businesses monitor review forums solely for the purpose of maintaining their brand image, but you can also use online review forums as another customer service channel. Here are 2 dos and 2 don’ts when it comes to responding to online reviews. 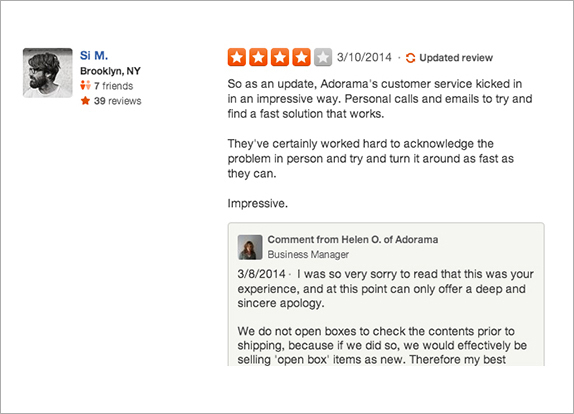 If a customer writes a negative review, investigate the claim with your staff. If your business was at fault, take the appropriate action to right the wrong, whether it’s writing an apology, offering a replacement item, or extending an offer for a free or discounted product or service. Don’t be afraid to admit that you made a mistake—but be quick to make amends for it. The vast majority of customers will still keep doing business with you if you make an effort to address their complaints in a timely fashion (within a week). Often times, customers will include questions or suggestions in the course of their review that they won’t take time to share with you personally. Don’t miss out on the opportunity to gain valuable insight into what your customers want and what you could be doing better. You don’t have to reply to every reviewer, but you should make an effort to answer any specific questions that come up and respond to users whose suggestions you’ve implemented. These kinds of interactions will make customers feel valued and involved in your process. Most patrons won’t take the time to review your business unless they’re exceptionally pleased or exceptionally displeased with their experience. Reading angry reviews, especially those that seem unprovoked by a real grievance, can be upsetting. Keep in mind that none of the comments consumers share are directed at you personally, and no single comment is representative of your entire customer base. While it may be challenging to remain calm when it feels like your business is under attack, replying with a heated or nasty comment will only fan the flames and draw more attention to that particular review. Keep your replies professional at all times, and as the old adage goes: If you don’t have anything nice to say, don’t say anything at all. Every system can be exploited for personal gain, and this includes review forums. The goal of most reviewers is simply to share their experience with others, but there are always a handful of people whose goal is to take advantage of businesses. Competitors may pose as patrons in order to publicly critique your business; users may write reviews of your business without having been a patron; others may purposely post harsh comments in hopes that you’ll offer a little something to make amends. For this reason, you need to be careful when it comes to online reviews. If a review seems fishy, it probably is, and you shouldn’t waste your time engaging with it. In general, online customer service follows the same rules as phone, email, and in-person customer service. If you reply promptly, stay professional, and treat people with generosity, you’ll be able to grow your customers’ loyalty. The added benefit of doing so on a public forum is that your actions can have an impact on a larger audience who isn’t directly involved in the conversation. Let your actions speak volumes of good things about your business, and others will notice.